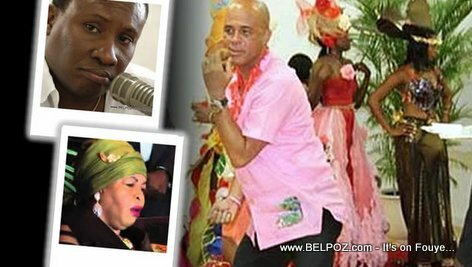 This 'required-or-else apology' is for Sweet Micky's remarks during the Carnival of Les Cayes vis-à-vis the two journalists, Liliane Pierre Paul and Jean Monard Metellus. Sanctions could include 3 years in prison and the inability for Michel 'Sweet Micky' Martelly and his band to perform for up to 10 years. Ohhh... He won't be able to hold public office for those 10 years neither, another source reported. Justice is a masquerade in Haiti. Only the poor gets punished for stealing a loaf of bread while those who steal billions are left alone. Daye lè yo tap persekutel la, mwen pat we moun ki te konn di bay fanmiy prezidan an respect, sak fenn pa al mande justis pou Jean Dominique ak mireille pito bann manje kk, pou moun aristid tiye mwen se sa k fe m rayi Mertelly paske l trop lach.